We're creating a Master Plan for the Thames River, representing both infrastructure needs and the community's recreational and ecological vision for the river. An Environmental Assessment (EA) is the process of determining what environmental impacts, if any, there will be during a project and how to minimize the impacts. The Environmental Assessment process falls under the Ontario Environmental Assessment Act. The term "environment" includes the natural, social, cultural, built and economic environments. What is the Focus for the One River EA? The One River EA covers the Thames River from Boler Road Bridge to the Forks of the Thames and Harris Park. 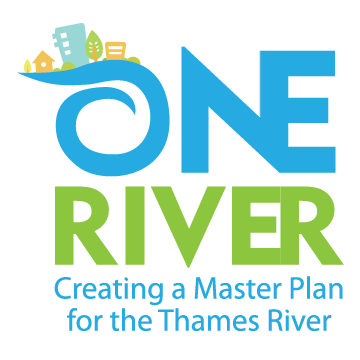 The One River EA will incorporate a number of ongoing plans, partnerships, and studies, including Back to the River, the Pollution Prevention and Control Plan, the Thames River Clear Water Revival, the London Official Plan, and the Thames Valley Corridor Action Plan. The One River EA brings these and other projects together to find integrated solutions to their broad social, economic, and natural environment issues. The overall goal of the One River EA is to improve the health of the Thames River and its social role in central London. The Thames River is both our inheritance and our living legacy. It is our collective responsibility to maintain and enhance its shared natural, cultural, recreational and aesthetic resource. The One River EA will consider the area historically influenced by the Springbank Dam, and will provide a plan that coordinates critical infrastructure projects in ways that preserve for future generations this valuable resource, and allow people of all abilities to enjoy and access this designated Canadian Heritage River. This study, in the context of many other ongoing initiatives to improve the Thames River, will endeavor to align important projects in a way that enhances the river overall, maintains the vision of the Back to the River’s “The Ribbon of the Thames” concept plan, and identifies potential impacts to downstream communities and where possible avoid them. Stage 1: The objective of Stage 1 was the selection of a preferred option for the future of the Springbank Dam which will be an influential factor in the identification and evaluation of the overall river management plan going forward. The option selected will inform the decision-making process on the overall river management plan. Following comprehensive review of each option, the evaluation identified Option 2, Free-Flowing River, as the preferred option. Option 2 ranked highest overall and provided the most benefits and best met the objective of the One River EA Problem/Opportunity Statement. Stage 2: With the option for the Springbank Dam selected, alternative strategies for river management, which consist of different types of projects related to infrastructure and river improvements, will be developed and assessed. Stage 2 is currently being carried out and is anticipated to be concluded in early spring 2019. This stage also includes stakeholder consultation, including consultation and engagement with First Nations and Metis, government approval agencies, interest groups and the general public. At this time, the Springbank Dam and “Back to the River” designs at the forks are completing the detailed screening process as prescribed for Schedule B Municipal Class Environmental Assessment projects. Following consultation, the master plan will be completed and provided to the public for review. The One River Environmental Assessment area of focus includes Thames River, contained by Boler Road Bridge to the Forks of the Thames and Harris Park. Join our mailing list to stay up-to-date on the One River EA. Connect with the One River project team with any questions or concerns. Thank you to everyone who participated and provided feedback during the first stage of the One River Environmental Assessment. The One River EA's first stage of consultation involving the Springbank Dam, whether to have a free flowing river or to reinstate the dam, has concluded. On January 16, 2018 City Council approved the One River Environmental Assessment Update: Phase II Stage I Report, which recommends the decommission of the Springbank Dam. What is the recommended option for Springbank Dam? Based on a comprehensive review of the options for Springbank Dam, the evaluation demonstrates that Option 2 – Free-Flowing River, as the preferred option. Option 2 rated the highest as providing the most benefits and best meeting the objectives of the Problem/Opportunity Statement to “maintain and enhance this shared natural, cultural, recreational and aesthetic resource” and “preserve for future generations this valuable resource and allow people of all abilities to enjoy and access this designated Canadian Heritage River”. What options for Springbank Dam were considered? What criteria were used in the evaluation of the Springbank Dam? The criteria for Springbank Dam were developed through consultation with project stakeholders, the general public, and engagement with First Nations. The criteria cover the range of potential changes from what is considered the baseline condition, which is the existing conditions in the river within the study area and the current condition of the dam. The baseline condition was established through the examination of various databases on water quality and the ecological environment, consultation and engagement, and field studies. The three categories of criteria represent potential impacts on the natural environment, the social/cultural environment, and technical/economic considerations. The criteria for the natural environment category include water quality, Species at Risk, terrestrial and aquatic habitat, as well as geomorphology (slope and river bottom stability) and groundwater and surface water interactions. The criteria for the social/cultural category include various forms of recreation, public health and safety, urban revitalization, First Nations interests, cultural heritage, and so forth. Technical and economic considerations include constructability, approvability (the ability to obtain required permits and approvals), operations and maintenance, relative capital costs, flood hazard, carbon footprint, and compatibility with existing and planned infrastructure projects. A description of each evaluation category and criteria is provided in Section 4 of the report. How did each option for Springbank Dam rank in each criteria category? Option 2, free-flowing river, ranked first in its ability to provide a benefit to the natural environment. It has the potential to improve water quality, aquatic and terrestrial habitats, and protect and enhance Species-At-Risk. Options 2 and 3, free-flowing river and reinstate the dam respectively, have similar ratings. Each of these options have potential to maintain and enhance social and cultural resources in the study area, albeit in different ways. For the technical and economic factors, Option 1, Do Nothing, rates highest as it is the easiest to implement with the least costs. Option 3 would be the most challenging to implement, in large part due to the anticipated difficulties in receiving permits and approvals. The detailed evaluation matrix is provided in Appendix F of the report. What public engagement and consultation took place? An overview of the consultation and engagement activities is provided in Section 7 of the report. What were the results of public feedback on the three option? Of those that completed the Public Information Centre survey, 70% of respondents supported an unobstructed river (Option 1 and Option 2) with 24% of respondents in support of reinstating the dam (Option 3). The remaining 6% were in favour of a combination of options or did not provide a response. How will the recommended option integrate with the Back to the River design? The Back to the River “Ribbon of the Thames” award-winning design incorporates a number of elements that support a River vision that has been called bold and exciting. It focuses on bringing people back to the River to enjoy a significant cultural and heritage resource and engage in activities that reflect the river’s beauty and cultural significance. Coordination with the Ribbon of the Thames Civitas/Stantec team has begun on how the design elements of Back to the River can be integrated into the EA evaluation and be adapted to potentially changing water levels. The design elements of the Ribbon of the Thames can be integrated into the range of water levels represented by the Springbank Dam options. Are there any opportunities for public comment on the report? Yes, the report is being presented for public comment at a Public Participation Meeting at Civic Works Committee on Tuesday, January 9, 2018, not to be heard before 5:45 p.m. The project team heard from many stakeholders and members of the public that it was important to have sufficient lead time to review the consultant’s report prior to a final public participation meeting on the Springbank Dam. How can I submit a comment for the Public Participation Meeting? Written submissions to be included on the Civic Works Committee Added Agenda for the meeting should be submitted by no later than 9:00 AM on January 8, 2018, either delivered or mailed to the City Clerk’s Office, Room 308, 300 Dufferin Avenue, P.O. Box 5035, London, ON, N6A 4L9. Submissions in accordance with the above-noted deadline may be emailed to CWC@london.ca. Personal information collected and recorded at the public participation meeting or submitted in writing on this subject is collected under the authority of the Municipal Act, 2001, as amended, and will be used by Members of Council and City of London staff in their review of this matter. The written submissions, including names and contact information and the report of the public participation meeting, will be made available to the public, including posting on the City of London’s website. A video recording of the meeting proceedings may also be posted to the City of London’s website. Questions about this collection should be referred to Cathy Saunders, City Clerk, 519-661-2489 ext. 4937. What are the next steps in the One River Environmental Assessment? Subject to council approval of this report, the One River EA project will move ahead as three separate initiatives. The “Forks of the Thames” initiative will consider the council endorsed “Ribbon of the Thames” design submission selected as part of the Back to the River international design competition. The “River Enhancements” initiative will consider river enhancement and improvements, building on public comments suggested during the first stage of the One River EA. This initiative will consider projects such as canoe and kayak launch locations, improvements to existing public amenity/look-out spaces, environmental stewardship projects, and erosion improvements. The final initiative the “Springbank Dam Decommissioning” will consider the most environmentally appropriate way to decommission the Springbank Dam. The One River Master Plan approach integrates multiple river-based projects to ensure that issues affecting each project will be fully considered in the evaluation of alternatives for other projects; while also taking financial advantage of overlapping study requirements. It began with the Springbank Dam in Stage 1, where any recommendation would have direct influence on other river-base projects. An endorsed preferred option for the Dam, a free-flowing river, has now been established after undergoing numerous public participation, First Nations, stakeholder consultation, committee, and City Council meetings. Forks of the Thames Options - select preferred and priority features based on the Back to the River Design by Civitas. We'll continue to work with consulting firm, Jacobs, and continue sharing environmental study work, remaining closely coordinated such that each stream can continue to completion without being delayed by the progress of another. Stage 2 Public Information Centre # 1 was held on Wednesday, June 6 at Museum London. Stage 2 Public Information Centre # 2 was held on Wednesday, October 3 at Central Library. Stage 2 Report Files can be found in the Document Library tab. Presentation Slides as presented during Public Information Session on June 6, 2018. Sign up for our Mailing List to stay up-to-date on the One River project.